I Quit Shopping, and so should you. I'm a big fan of Sarah Wilson and her I Quit Sugar movement (even when she gets a little extreme), and maybe I have discovered the next logical step: I Quit Shopping. My shift away from the pass time of "just looking" at clothing stores was inspired by the younger women in my life. I have a lot of Gen Y and Generation Next chickies around me and, yes I know I'm not that much older, but I've been surprised to learn how many of them have given up spending money on evening wear. At their ages I owned a wardrobe brimming with dresses, skirts, tops, even gowns that I'd bought (usually with credit cards) for specific events and mostly worn just once. It seems my younger counterparts are on to something, and in the interests of our savings accounts, I think it's time those of us in Gen X and beyond, paid attention. Younger women don't shop anymore; they rent. Sure, there's still the need to stock up on daily essentials and work wear. But the splurge on a new outfit days before a wedding, hen's night, Christmas party or formal has come to an end. And when it comes to casual dressing, my young friends often now have enough spare cash to invest a little more. I first looked into dress hire a couple of years ago, and quickly realised it makes financial sense. MC'ing the launch of the Perth Firefighters Calendar 2018, in a rented play suit. 3 or so years ago it wasn't unusual for me to spend $3-400 on a dress ahead of a wedding. Sometimes more. I'd usually wear that same dress to a work event, store it a period of 4+ years before deciding it's out of fashion/boring/damaged and donating it to the nearest Salvos. That's a cost-per-wear of $150-200, without taking into account the interest I paid on all those credit cards. Ugh, *shudder*. If only someone had been able to make me aware of the financial mistakes I was making sooner! All that unnecessary spending could have seen me in my first home a good ten years earlier. I might also have needed less help from my parents to get that house. I could be closer to retirement.. it goes on! Let's be real, I probably wouldn't have listened to anyone who tried to reign in my spending. But dress rental wasn't a thing back then. It is now. I've been wearing a lot lately from Ignite the Night. You can hire a cocktail dress there for as little as $40 a night (top price $120). Rental ball gowns are priced between $150 and $220. Plus, many of the dresses, gowns and playsuits you have to choose from are worth much more than that $3-400 I used to spend so painfully often. You can even hire a matching clutch and statement accessories to complete your outfit. Or choose something to buy from Ignite the Night's range of jewellery, body chains, bralettes and more. The other reason I've chosen to feature Ignite the Night here is their variety of sizing. I have a fairly easy to dress body shape but I've left other dress rental stores frustrated that nothing in their high fashion range would fit me. If you've ever felt the same, you need to visit Louise Scanlan and her team. Louise has an incredible eye and will load the fitting room with multiple frocks to suit you in a mere moment. No matter your body shape or size. I can't stress this fact enough. 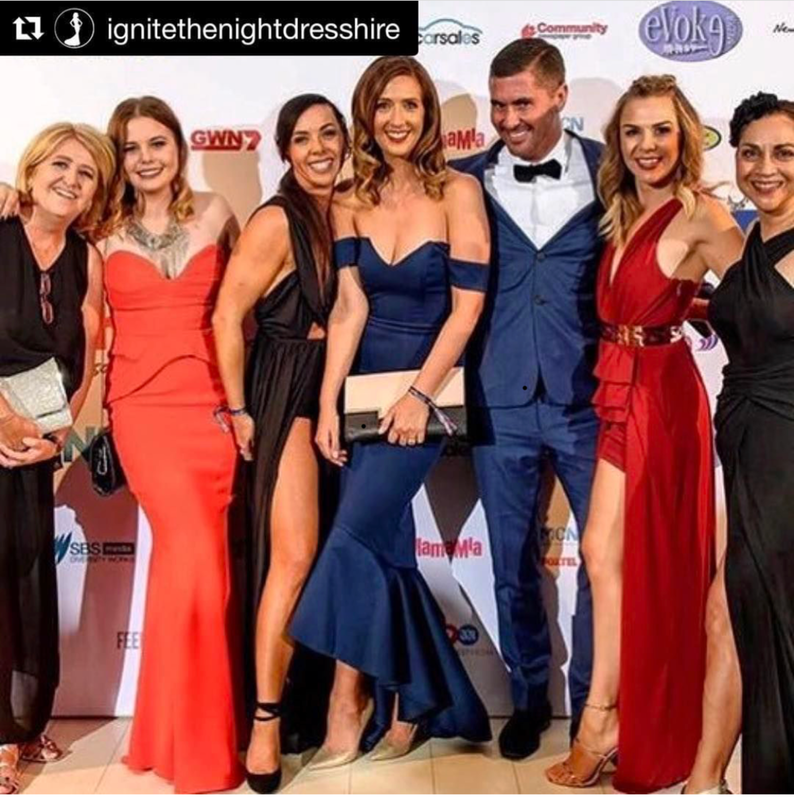 If you're ever felt intimidated by the dress rental or shopping experience, concerned a store won't have anything to fit you, I truly believe you'll be delighted by the range at Ignite the Night. You can even view by appointment so you have complete privacy. Or walk in and browse, just like any other boutique. I recently tried the complete Ignite the Night Dress Hire and Beauty experience, complete with make up in store by talented make up artist, Liv. .. And hair styling next door by Tash at Terrace for Hair. Make up by Liv at Ignite the Night Beauty Bar. Hair styling next door by Tash at Terrace for Hair. Mention this blog when hiring at Ignite the Night Dress Hire, 101 South Terrace Fremantle, to get 15% off. PS: Here's a little more of us playing dress ups at Ignite the Night Dress Hire. Click the image to scroll through the gallery. Hired an Ignite the Night dress? Use #ignitethenightdresshire on Instagram.